Padmanabh Bendre was born in 1946 in Chennai. In 1967 he completed his Bachelor of Architecture from M.S. 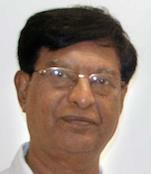 University, Baroda and in 1968 he completed his Master of Town Planning from Pune University, Pune. In 1995 he had several solo shows including One Man Show in San Francisco, USA. In 2003 he had Private shows in Phoenix and San Francisco, USA and at the Museum Art Gallery, Mumbai. In 2006 he participated in a group show at the South Asian Gallery of Arts, Toronto. Since 2006 Padmanabh has had several solo and group shows. His works are in notable collections in India and overseas. He is also the son of N.S. Bendre (eminent modern artist). Padmanabh lives and works in Mumbai.